The House: After a difficult year, UK-China relations have improved in recent months. How important are visits from ministers such as George Osborne in developing ties and deepening understanding? Ambassador Liu: Frequent exchange of high level visits is the hallmark of recent China-UK relationship. For example, Chancellor Osborne, Mayor of Greater London Boris Johnson, Energy Secretary Davey and Secretary for Transport McLoughlin have all visited China. Chancellor Osborne and Chinese Vice Premier Ma Kai successfully co-chaired the fifth China-UK Economic and Financial Dialogue. This dialogue produced a long list of 59 outcomes totaling 9 pages. They covered three main areas: strengthening macroeconomic policy coordination, promoting trade and investment and enhancing financial cooperation. Specifically, the Chinese authorities agree to an initial UK RQFII quota of 80 billion RMB. Britain allows Chinese banks to set up branches in the UK. China and Britain will jointly develop the Manchester airport city. This 800 million pounds contract is one of the largest collaboration projects between China and Britain. China and Britain also signed an MOU on civil nuclear power cooperation. This MOU has opened up new space for our cooperation. The two sides will work together to promote a forward-looking, mutually beneficial and growth-oriented China-UK economic and financial relationship. As Chancellor Osborne commented on his China visit, these outcomes marked a big step forward in China-Britain relations. Both China and the UK are big countries with global influence. The growth of China-UK relations not only serves the shared interests of both countries but also contributes to world peace and development. We stand ready to work with the British side for a more healthy and stable China-UK relationship on the basis of respecting each other's core interests and major concerns. We welcome Prime Minister David Cameron to visit China at a time of mutual convenience. Currently, the two sides are actively coordinating on his visit. The House: Are British attitudes towards China outdated and in need of change, as George Osborne suggested on his visit? Ambassador Liu: I fully agree with him. The world keeps changing and moving forward. Our views and perspectives should reflect the changes. Otherwise we would fall way behind the times. A simple analogy would be if someone still believes that long ball is the sole tactic of English football, then surely he is out of touch! In the past three decades, China has experienced great and profound changes. Let me describe some key factors. The Chinese economy has maintained fast and sound growth. Democracy and rule of law continue to advance. Social programs are achieving comprehensive progress. People's living standards keep rising. China is taking strides towards realizing the 'Chinese Dream'; this encapsulates China's drive for strength and prosperity of the country, revitalization of the nation, and a better life for all its people. Against this backdrop, a new 'China view' is taking shape around the world. But some Western people still have misunderstandings and misgivings about China. In particular, Western media have deeply held prejudices against China. 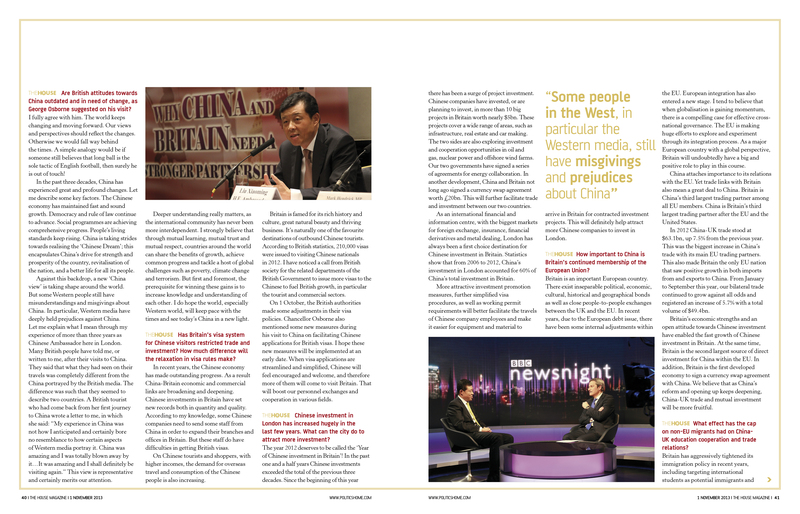 Let me explain what I mean through my experience of more that three years as Chinese Ambassador here in London. Many British people have told me, or written to me, after their visits to China. They said that what they had seen on their travels was completely different from the China portrayed by the British media. The difference was such that they seemed to describe two countries. A British tourist who had been back from her first journey to China wrote a letter to me, in which she said, "My experience in China was not how I anticipated and certainly bore no resemblance to how certain aspects of Western media portray it. China was amazing and I was totally blown away by it….It was amazing and I shall definitely be visiting again". This view is representative and certainly merits our attention. Deeper understanding really matters as the international community has never been more interdependent. I strongly believe that through mutual learning, mutual trust and mutual respect, countries around the world can share the benefits of growth, achieve common progress and tackle a host of global challenges such as poverty, climate change and terrorism. But first and foremost, the very prerequisite for winning these gains is to increase knowledge and understanding of each other. I do hope the world, especially Western world, will keep pace with the times and see today's China in a new light. The House: Has Britain's visa system for Chinese visitors restricted trade and investment? How much difference will the relaxation in visa rules make? Ambassador Liu: In recent years, the Chinese economy has made outstanding progress. As a result China-Britain economic and commercial links are broadening and deepening. Chinese investments in Britain have set new records both in quantity and quality. According to my knowledge, some Chinese companies need to send some staff from China in order to expand their branches and offices in Britain. But these staff do have difficulties in getting British visas. On Chinese tourists and shoppers, with higher incomes, the demand for overseas travel and consumption of the Chinese people is also increasing. Britain is famed for its rich history and culture, great natural beauty and thriving business. It is naturally one of the favorite destinations of outbound Chinese tourists. According to British statistics, in 2012, 210,000 visas were issued to visiting Chinese nationals. I have noticed a call from the British society for the related departments of the British government to issue more visas to Chinese to fuel British growth, in particular the tourist and commercial sectors. On 1 October, British authorities made some adjustments in their visa policies. Chancellor Osborne also mentioned some new measures during his visit to China on facilitating Chinese applications for British visas. I hope these new measures will be implemented at an early date. When visa applications are streamlined and simplified, Chinese will feel encouraged and welcome, and therefore more of them will come to visit Britain. That will boost our personnel exchanges and cooperation in various fields. The House: Chinese investment in London has increased hugely in the last few years. What can the city do to attract more investment? 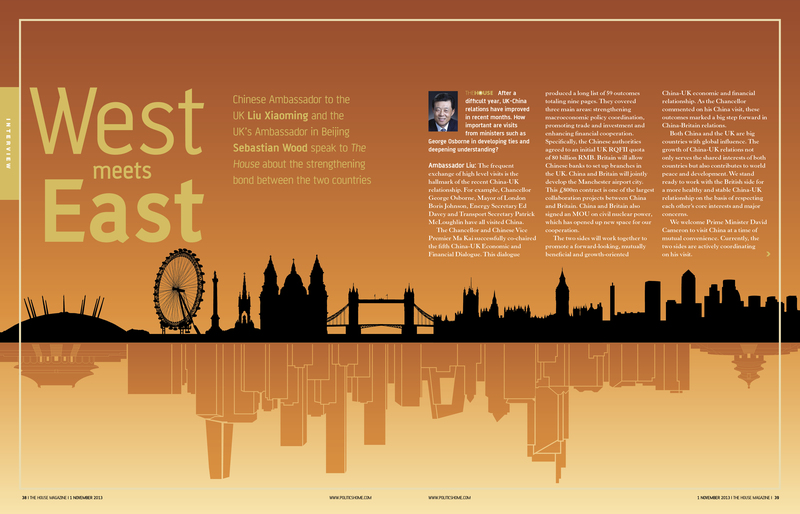 Ambassador Liu: The year 2012 deserves to be called the 'Year of Chinese investment in Britain'! In the past one and a half years Chinese investments exceeded the total of the previous three decades. Since the beginning of this year there has been a surge of project investment. Chinese companies have invested, or are planning to invest, in more than 10 big projects in Britain worth nearly 5 billion US dollars. These projects cover a wide range of areas, such as infrastructure, real estate and car making. The two sides are also exploring investment and cooperation opportunities in oil and gas, nuclear power and offshore wind farms. Our two governments have signed a series of agreements for energy collaboration. In another development, China and Britain not long ago signed a currency swap agreement worth 20 billion pounds. This will further facilitate trade and investment between our two countries. As an international financial and information centre, with the biggest markets for foreign exchange, insurance, financial derivatives and metal dealing, London has always been a destination of first choice for Chinese investment in Britain. Statistics show that from 2006 to 2012, China's investment in London accounted for 60% of China's total investment in Britain. More attractive investment promotion measures, further simplified visa procedures as well as working permit requirements will better facilitate travels of Chinese company employees and make it easier for equipment and material to arrive in Britain for contracted investment projects. This will definitely help attract more Chinese companies to invest in London. The House: How important to China is Britain's continued membership of the European Union? Ambassador Liu: Britain is an important European country. There exist inseparable political, economic, cultural, historical and geographical bonds as well as close people-to-people exchanges between UK and EU. In recent years, due to the European debt issue, there have been some internal adjustments within EU. European integration has also entered a new stage. I tend to believe that when globalization is gaining momentum, there is a compelling case for effective cross-national governance. EU is making huge efforts to explore and experiment through its integration process. As a major European country with a global perspective, Britain will undoubtedly have a big and positive role to play in this course. China attaches importance to its relations with the EU. Yet trade links with Britain also mean a great deal to China. Britain is China's third largest trading partner among all EU members. China is Britain's third largest trading partner after the EU and the United States. In 2012 China-UK trade stood at 63.1 billion US dollars, up by 7.5% from the previous year. This was the biggest increase in China's trade with its main EU trading partners. This also made Britain the only EU nation that saw positive growth in both imports from and exports to China. From January to September this year, our bilateral trade continued to grow against all odds and registered an increase of 5.7% with a total volume of 49.4 billion US dollars. Britain's economic strengths and an open attitude towards Chinese investment have enabled fast growth of Chinese investment in Britain. At the same time, Britain is the second largest source of direct investment for China within the European Union. In addition, Britain is the first developed economy to sign a currency swap agreement with China. We believe that as China's reform and opening up keeps deepening, China-UK trade and mutual investment will be more fruitful. The House: What effect has the cap on non-EU migrants had on China-UK education cooperation and trade relations? Ambassador Liu: Britain has aggressively tightened its immigration policy in recent years, including targeting international students as potential immigrants and canceling PSW in April last year. As the situation stands now, the new measures have not greatly discouraged Chinese students. Last year's figures showed that the numbers of students from many countries dropped sharply. For example, the number of Indian students plunged by 24%. In contrast, Chinese students kept coming to Britain with an increase of 17%. This fully demonstrates that Chinese students do not intend to join the immigrants. They will not stay longer than necessary. The sole purpose of their coming to Britain is to acquire knowledge and expertise for their career in China. Of course many Chinese students welcome the opportunity to work as interns or short term contractors in Britain after their study so that they will be able to gain some experience in real workplace. This is because practical skills are highly valued by employers in China. I am sure that if the British government introduces measures to support internships of international students and simplify visa procedures, more Chinese students will come to study here. However, the tough immigration policy has did affect the rotating and visa application of staff in Chinese invested companies. The newly-adjusted 2011 immigration regulations introduced even stricter rules for working visas. Some Chinese companies face more restrictions in dispatching people to work in Britain. Besides, due to a reduction in the size of UKBA, there are greater uncertainties in working visa application and processing for Chinese employees. This has added to the difficulties of Chinese invested companies operating in Britain. At present, China-UK trade is growing fast. Our people-to-people exchanges are becoming closer. I hope the British authorities will take into full account the needs of bilateral cooperation and provide convenience and assistance for Chinese visitors when formulating and implementing visa policies. The House magazine is an official publication of the British Parliament. A weekly issue with a circulation of about 7000, the House is a main publication for MPs and senior government officials to follow parliament activities and current affairs.